Pudong is expected to become a cluster of science and technology innovative resources. 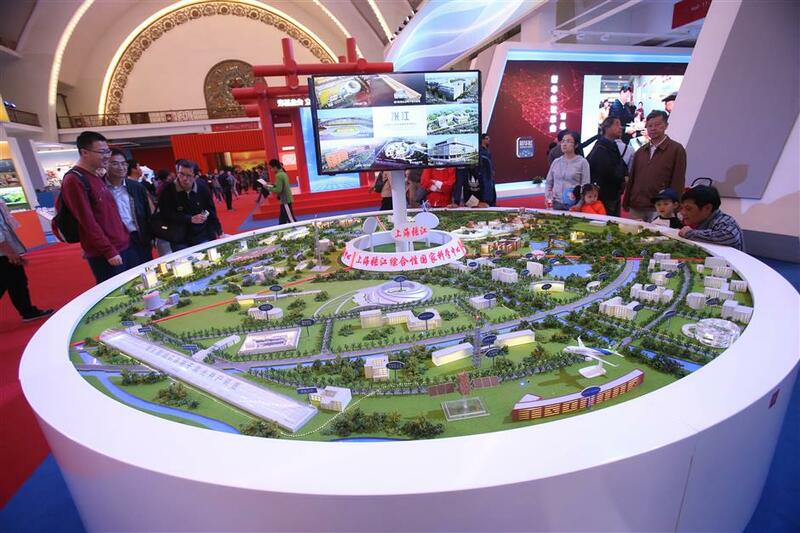 Visitors are attracted to the model of the Zhangjiang High-Tech Park in the Pudong New Area at an exhibition in Beijing in October, highlighting China’s major scientific centers in Shanghai’s Zhangjiang, Beijing’s Huairou and Anhui Province’s Hefei. As a core functional area to promote the development of Shanghai International Science and Technology Innovation Center by 2020, Pudong is expected to become a cluster of science and technology innovative resources. This means there needs to be an improved ecology for innovation and entrepreneurship, as well as a cultural environment. The plan to turn Shanghai into an innovation hub with global influence concentrates on two areas — Zhangjiang and Lingang. Zhangjiang will become a science city by 2020 amid the national strategy to establish a comprehensive scientific center on its ground. The future science city will gather innovative professionals, national scientific facilities, leading universities, research institutes and R&D centers from multinational enterprises. Meanwhile, Lingang will become a cluster of intelligent manufacturing. Shanghai is to offer 5 billion yuan (US$756 million) to fund smart manufacturing in Lingang. Lingang itself will subsidize 10 to 30 percent of the potential investment from companies in key smart manufacturing projects in strategic innovative industries, such as robotics, new energy, offshore engineering equipment and civil aviation. Hence, five supportive systems will be introduced to help achieve the goals set by the action plan. A technological achievements transfer promotion system will be built to encourage science technology innovation. A high-end, innovative industrial system will be prompted by technology revolution and industrial reform. A human resources system with global competitiveness will help Pudong to become a highland of talent. It joins hands with a science and technology innovation system, as well as the improved service model and system for sci-tech innovation to become the rest of the five pillars to support future success. At present, Pudong has 554 R&D centers, including 220 established by multinational enterprises. Within three years, the number of R&D centers will be increased to 600, among which more than 240 will belong to multinational companies. Currently, the new area has 1,711 high-tech firms and 490 leading experts. The numbers will be increased to over 1,800 and 600 respectively by 2020. Moreover, high-tech firms in Zhangjiang are expected to contribute 350 billion yuan of industrial output in three years, while Lingang’s gross values will reach over 200 billion yuan. Based on a modern equipment manufacturing industry, Lingang will become a new town, featuring science and technology, culture, finance, trade and tourism. A low-carbon, ecologically friendly, livable and sustainable city with blue skies, clean water and surrounded by tall trees will come into birth. Officials say green is the theme of the new town’s development. Lingang is also going to be a popular tourists’ destination for the Yangtze River Delta. It will develop tourism products featuring Dishui Lake and maritime and ecological attractions. The lake and the east shore will be the core area in the development of the local landscape. Pavilions and facilities for maritime cultural exchange and international conferences, exhibitions and performances will be built on the western and northern islets. Sports events such as sailing, rowing, running and cycling will be held regularly. Lingang aims to attract a wide range of talent and create a space where people can live comfortably. Residents will enjoy preferential housing prices, low rent apartments or even housing subsidies. Apart from affordable housing, Lingang is developing a low-carbon, green public transport system. Buses serving the streets, at the main urban area of Lingang, are no-emission electric ones. By 2020, public transport throughout Lingang will switch to 100 percent emission-free. At the same time, a cluster of research institutions devoted to frontier science will be formed in Zhangjiang. Work is underway to build a national laboratory as the base for scientific innovation, functional research and development platforms for interdisciplinary collaboration and innovation, and a network for collaborative innovation that links research with the industrial chain. The comprehensive national scientific center will also initiate and coordinate large-scale international research projects and national key projects. Covering an area of 5.29 square kilometers, the future national lab in the northwest of Zhangjiang will feature a world-leading photonic science center and the core area of scientific and technological innovation. The surrounding areas are where universities, research institutes of national level, world class research and development facilities and immense scientific instruments will reside. Those instruments are the major components of the infrastructure being developed for the national scientific center, such as Shanghai Synchrotron Radiation Facility, which uses “synchrotron radiation” technology to create super beams that are hundreds of millions of times brighter than a normal X-ray. Apart from the SSRF, the Shanghai Superintense- Ultrafast Lasers Facility, the soft and hard X-ray free-electron laser devices, as well as the live cell structural and functional imaging platform are being developed in Zhangjiang. The Zhangjiang Comprehensive National Scientific Center also seeks to integrate all the excellent research and educational resources within the city and beyond by attracting top research institutions and universities from around the world to establish innovation platforms on site. A series of research centers of renowned universities will be established in Zhangjiang. The Tsung-Dao Lee Research Center, for instance, which is named after the Shanghai-born scientist who won the Nobel Prize for physics in 1957, will focus on particle physics, astronomy, cosmology and quantum science and technology. Other similar facilities include a University of Science and Technology of China innovation center, focusing on quantum information science and technology, a stem cell research center associated with Tongji University and a robot research center associated with ShanghaiTech University.